To answer the question above......well, you can't. 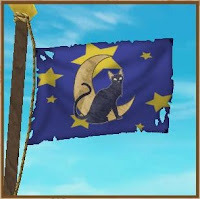 But I do hope this is a feature that Pirate101 will add in the future. Here's the thing. 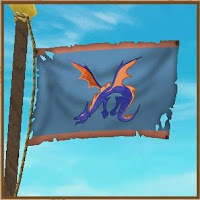 Right now you create your flag before you even start the game, when you are making your pirate. And as of now it can't be changed. 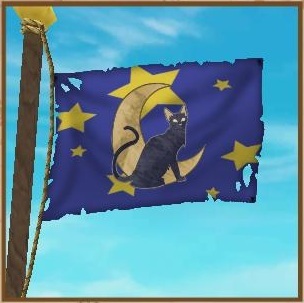 The flag's colors determine the color of your companions' clothes. New pirates may not realize this and just choose the first thing they see, not realizing it can't be changed later on. This leads me to two different changes I think KI may want to consider making in the future. First of all, I think that Pirates should create their flags when they get their first raft. The "Flag Design" window could pop up when you get your first raft, instructing you to design your flag. This would give new players a feel for the game before they make their flag choices. My second idea is the ability to change your flag. This would be a useful option to have, even if we would only be able to change the colors and not the designs. I wouldn't mind if it cost crowns. I think 100-200 crowns would be reasonable to change the color, and maybe more to change the designs as well. Or maybe there could be "Flag Dying" available for gold, and "Flag Designing" available for crowns. There are a few ways that Kingsisle could incorporate this feature into the game. There could be a person you go to, like the Dye Shop or Eloise Merriweather. There could be options available in the Crown Shop, maybe in the form of a "Flag Change Potion" or something. Or there could be a "Flag Design" window you could open from the "Ship" menu area. I totally like your post. I wish could change my flag. 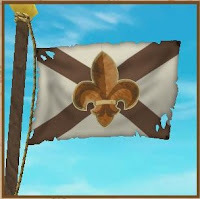 i think there should be a flag dye shop where you can change the flags colors for x amount of gold and the design for slightly more gold. that way you dont have to totally commit to something you chose in the beginning, before the game even started, unknowing how it would look ingame. KI should really make this a reality considering practically everyone and their brother wants it to be an option.